sns.set_style() sets the background theme of the plot. "ticks" is the closest to the plot made in R.
sns.set_context() will apply predefined formatting to the plot to fit the reason or context the visualization is to be used. font_scale=1 is used to set the scaele of the font size for all the text in the graph. 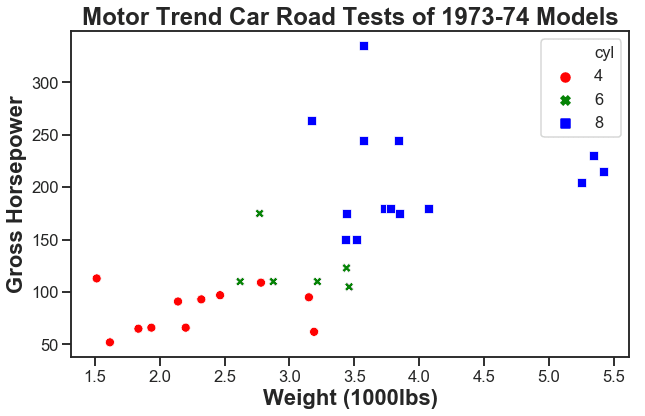 x="wt"maps the weight to the x-axis. y="hp"maps the horsepower to the y-axis. hue="cyl"will fill and color the scatterpoints. palette=['red','green','blue']manually overrides the color palette that is set by hueto red, green and blue. 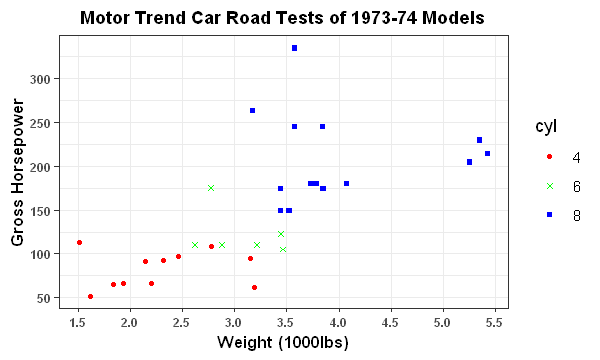 data="mtcars"allows us to use the data in the dataset. style='cyl'assigns shapes to each cyinder category. plt.title() gives the plot its main title. If you are an experienced Matplotlib user or used plt.suptitle() before you know the confusion when using the two together. The arguments are self-explanatory. plt.xlabel()will format the x-axis label. I use set_.. to access the class to include the aesthetic properties. 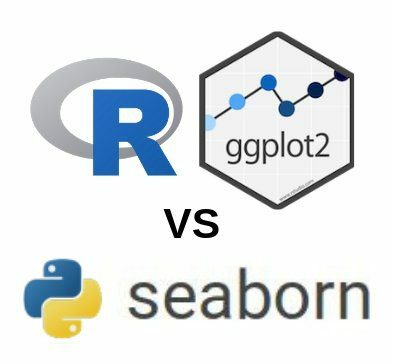 This can get cluttered at times but there are many ways to format a seaborn/matplotlib plot. This is useful for after the plot has been created. The plot was already made with sns.scatterplot so now we need to override the default formats in this manner. sns.relplot()has many of the same parameters discussed above and here we will discuss the new ones as this plot is geared towards faceting. col="gear" specifies which column in the mtcars dataset to use for faceting. col_wrap=3 specifies the placement of the plots. In this case, the plots will be placed in 3 columns. It will be in one row since the number of rows were not specified but this can be done if needed. aspect=0.6 is a control for the size of the plot. I suggest reading the documentation on this as it can become confusing to explain at this point. g.fig.suptitle()creates the title for the plot. g.set_xlabels & g.set_ylabels will work as previously discussed. 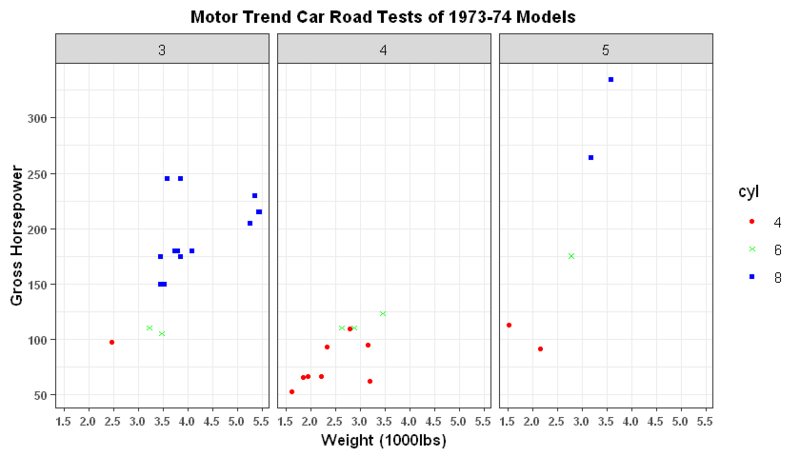 ggplot(mtcars, aes(x=wt, y=hp)) will load the mtcars dataset to be used in ggplot2 and aes(x=wt, y=hp) will map the aesthetics for our plot with the x aesthetic as weight for the x-axis and y aesthetic with Horsepower for the y-axis. theme_bw() provides a pre-made theme in ggplot2 for us to get started. This can then be easily adjusted with the right commands. 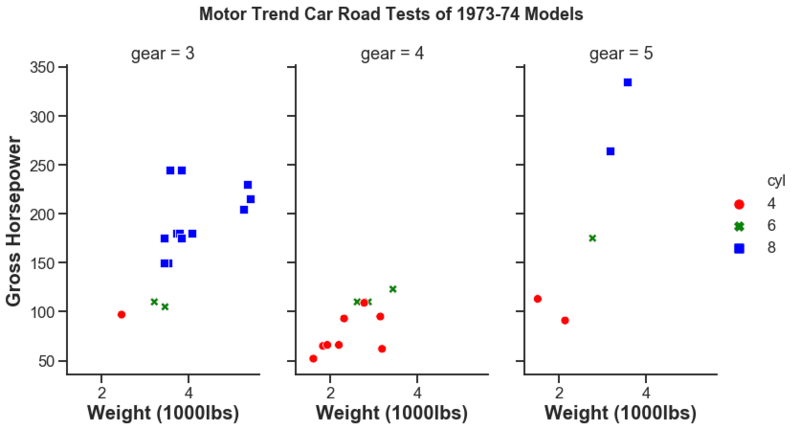 ggplot2 has a simple and easy to learn syntax for this task which makes it easy to manipulate. theme() is the command that allows you to change the default settings of any theme that is already set in point 3 (you can also use it to change the other aesthetics of the plot). axis.text=element_text(face='bold', size=7formats the text of the y-axis and x-axis (the numbers on the axis). face='bold' will bold the text while size="7" will increase its size to the specified amount. axis.title=element_text(face='bold', size=10)works the same as the command above but for the axis titles only. axis.ticks=element_line(size=0.5) will make the ticks on the graph have a more obvious appearance. panel.background=element_rect(colour = NA)is an aesthetic measure I decided to add which gets rid of the rectangular border surrounding the graph. plot.title=element_text(face='bold', size=11,hjust = 0.5)) simply bolds and changes the size of the main title. hjust=0.5will center align the title. scale_color_manual(breaks = c("4", "6", "8"), values=c("red", "green", "blue"))will override the default color scheme and add red to '4', green to '6' and blue to '8'. This manually overrides the outline color of the scatterpoints. scale_fill_manual(breaks = c("4", "6", "8"), values=c("red", "green", "blue")) will do the same as above but for the inside of the scatterpoints this time. scale_y_continuous(breaks = seq(0,350,50)) manually overrides the numbers on the y-axis to start from zero and end at 350 with 50 unit increments. This will show on the major ticks. scale_x_continuous(breaks = seq(1.5,5.5,0.5), minor_breaks=seq(1.5,5.5,1)) does the same as above for the x-axis and manually overrides the minor ticks but this will not be as obvious. scale_shape_manual(values=c(21,4,22)) will define what type of shape to give each category of cylinders.